The best place to see some films isn’t necessarily the cinema. Some are best viewed on drowsy Sunday evenings, some with friends, pizza, and sarcasm, and a few are best stumbled upon at some insomniac hour of the night, half awake and terrified of the horrible thing you’re watching (say, Funny Games). Arguably, the best place to view Meet Me in St Louis is blissed out in front of the TV on Boxing Day, surrounded by Quality Street wrappers and your sleeping grandmother. Still, given how festive it feels, it’s unsurprising that the BFI are re-releasing it cinematically over the Christmas season. Meet Me in St. Louis is notable for being one of the first cinematic musicals to actually integrate its songs into the narrative, coming from the characters rather than being a random assortment of popular hits. Still, the plot is so paper thin that this scarcely matters. The patriarch of the Smith family (Leon Ames) plans to move his family from St. Louis to New York. 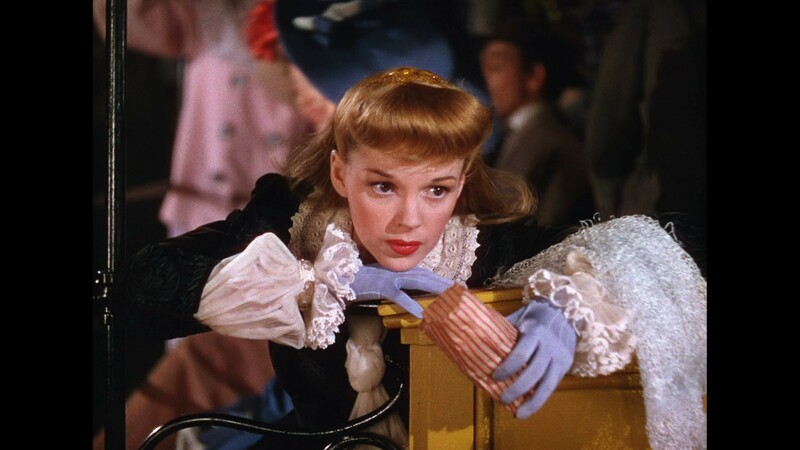 The elder daughters (Lucille Bremner and Judy Garland) are bothered about this due to their blossoming romances, and the father eventually changes his mind. That’s pretty much it, which means the film is heavily padded, featuring a weird fixation with minutiae that adds to the feeling that incredibly little is actually going on. Perhaps more than in The Wizard of Oz, Meet Me in St. Louis represents Garland’s apogee as a star. It makes the experience of watching her more poignant now than it would be for audiences of the time. Her character may get a husband and the happy ending that is compulsory with such things, but Garland herself was headed for a slow, tragic decline. What we’re left with is Garland at her brief, winsome best, singing “Have Yourself a Merry Little Christmas” and completely breaking your heart. Interestingly, that most depressing of Christmas songs performs the function in the film of being a lie Garland tells her younger sister when all hope seems lost. A song which has always seemed excessively melancholy finally has a context: a sad, beautiful fiction, sung to a child. More than the costumes, the songs or the plumminess of the accents, what feels truly old-fashioned are the attitudes of the characters. It’s unsettling to see a world where a father is the only authority in his family and where getting married is the sole life goal for a proper young girl. But the film is lovely enough that it isn’t too difficult to acknowledge that and put it aside—the past is a foreign country, etc.—and focus on just enjoying the thing. Gorgeously shot and filled with rousing songs and dialogue that’s agreeably flinty when it’s not being bland, Meet Me in St. Louis is one of the finer musicals of cinema history. If it’s not to be watched while merry on mulled wine and waiting for someone to get out Trivial Pursuit, seeing it in a cinema feels like a rare treat—a way to spend a few hours in a glorious Technicolor world in which everyone sings and everything is going to be alright. For that small measure of escapism it’s worth dressing up for and braving the cold: we could all use the break.